These moist Apricot Gem Bars have a great flavor. 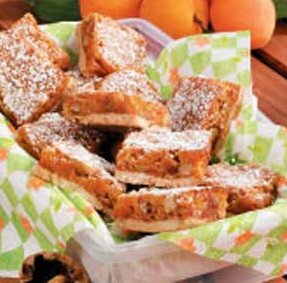 Everyone goes for these gems of a dessert, so treat your family and guests to these Apricot Gem Bars! You can make these bars days in advance as long as you store in airtight containers. I have had this recipe for years, and I have no idea where it is originally from. I do know that they are easy to make and so very delicious! Preheat oven to 350 degrees F. Grease or butter an 8-inch square baking pan. In a small saucepan over medium-high heat, place apricots; cover with water and slowly simmer for 10 minutes. Remove from heat, drain, and cool. When cool, chop into small pieces; set aside. In a food processor, mix together butter, sugar, and 1 cup flour until crumbly. Spread mixture onto bottom of prepared baking pan. Bake approximately 25 minutes or until light brown; remove from oven. In a medium bowl, combine 1/2 cup flour, baking powder, and salt. In a small bowl, gradually beat brown sugar into eggs; add to four mixture and stir until well combined. Mix in vanilla extract, nuts, and chopped apricots; spread onto top of baked layer. Bake 30 minutes or until lightly browned; remove from oven and let cool completely in baking pan on a wire rack. Cut into bars and then roll in sifted powdered sugar. These bar cookies are similar to Starbucks’ Cranberry Bliss Bars, which are a popular accompaniment to eggnog lattes during the holidays. Here is something new and tasty to do with all those apples you picked at the orchard. This treat tastes remarkable like an apple Danish; but unlike a Danish, it’s easy to make. Since I love mincemeat, this is a perfect way to serve it during the holiday season. These cookies are a very chewy cookies and delicious cookies. Makes a great Christmas cookie.